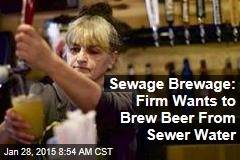 Oregon is known for specialty beers, but what about a beer made with sewer water? What if the water was purified to a point even cleaner than drinking water? “I’ve been brewing beer since 2006,” said home brewer Jeremie Landers. It’s not his full-time job, but home-brewing is certainly Landers’ favorite hobby. He’s even converted the garage of his North Portland home into a tap room. “I love the experimentation process,” said Landers. That is why this summer, Landers will be one of more than a dozen local home-brewers taking part in a unique experiment. “’Is there another use we can use for it to meet our long-term water needs?’, and Oregon needs to be thinking about that,” said Mark Jockers, with Clean Water Services. The agency says this special purification system is able to make sewer water even cleaner than your typical drinking water.